How to choose a cross-country mountain bike: Cross-country bikes (also known as "XC bikes") are intended for use on cross-country trails, whether recreational or competitive. 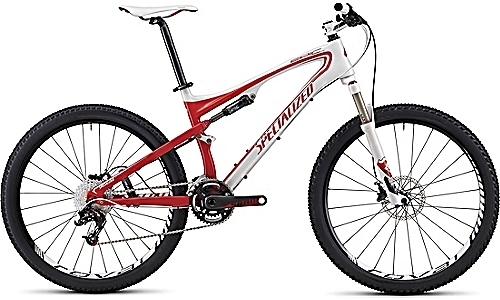 They come in two varieties - full-suspension or hardtail, which have front suspension only. In either case, suspension travel will very rarely exceed 4.5-inches. Both 26” and 29” wheel sizes are available. Cross-country bikes are most commonly spec'd with three chainrings in the front and nine gears in the back (3x9), but 2x10 is becoming increasingly popular. The tires that come on cross-country bikes are relatively skinny, and are often around 2.1-inches wide and are made to roll fast. Cross-country bikes are usually the lightest type of mountain bike. They climb hills very well, but don't offer as much comfort on the way back down as a longer travel bike will. Suspension: The quality of fork and rear shock play a major role in how a bike rides. The best suspension will feature rebound, compression, and preload settings. Brakes: Brakes that perform well encourage you to ride better, simply because you know that when you need to stop or slow down, you can. Look for hydraulic disc brakes from a reputable brand (Avid, Hayes, Shimano, Magura, and Hope are all good brands). Saddle: Since you’ll be seated a lot on an XC bike, it’s important that your bike has a comfortable saddle. Test a few out before making your purchase. Many shops will even allow you to swap saddles when you purchase a complete bike. Seatpost: Height-adjustable (also known as “dropper”) seatposts are an incredible addition to any all-mountain bike. They make it convenient to change your saddle height on the fly to the ideal position for the terrain you’re approaching. If this option is available to you, we highly recommend it. Stem Length: On an XC bike, you’ll want a stem in the 60-100mm range. Anything longer and the bike will be difficult to steer in certain technical riding situations. We recommend a shorter stem and wider bars whenever possible. The most common way to size a cross-country bike is “standover” height, also known as inseam clearance. You want plenty of room between you and the top tube when you come to a stop, especially on uneven surfaces. As a rule of thumb, there should be at least four inches of clearance from the top of your inseam to the top of the top tube. Note that for some frame models the distance will be much larger than four inches due to a sloping top-tube. This is okay, provided the length and cockpit area of the bike fit you well. Most manufacturers provide suggested sizing charts, and because models vary so much between categories, we recommend searching for the chart specific to the bike you’re interested in. It’s important to note that everyone has different riding preferences, so it’s best to test out a variety of sizes before making a final decision. Carbon Fiber - Carbon fiber is basically very thin strands of carbon that can be twisted and woven together, like cloth. To make carbon fiber take on a permanent shape, it can be layered over a mold, then coated with a stiff resin or plastic. It is among the lightest materials and is commonly used for high-end cross-country and all-mountain bikes. More recently it has found its way into some downhill and freeride frames. Because carbon technology is advancing very quickly, costs are being lowered and durability is increasing. If you’re considering a cross-country bike, you’ll need to decided between 26 and 29-inch wheels. For many years, 26-inch wheels were the standard on these types of bikes, but recently 29-inch wheels (commonly known as “29ers”) have become increasingly popular. The larger diameter wheels roll over obstacles more easily and the tires can be run with less air pressure, providing better traction. On the other hand, larger wheels are heavier, more flexible, and there are fewer component and tire choices available. If you’re on the fence about wheel size, we highly suggest testing both sizes before making a purchase. 29ers with no suspension (front or rear) are also becoming more popular. Because of the increased wheel size, these bikes still ride over rough terrain relatively smoothly. Because they don’t have suspension, they are typically cheaper and easier to maintain. Deciding how much to spend is a tough decision. As a general rule, the more you spend the better bike you get. There will be major difference between a $900 bike and a $3500 bike. In general, the more expensive a bike is, the more durable it will be (at least until you start getting into the high-end where lightweight construction may reduce durability) and the better components will perform. If you’ll be riding regularly, we recommend spending at least $900 on a cross-country bike. Anything less and you’ll be constantly repairing the bike and replacing components. If you’re a first-time buyer, you may be tempted to purchase a low-end bike and later upgrade the components as necessary. Know that it is often much cheaper to buy the components on the bike in the first place than it is to buy components later and upgrade. For comparison, the three bikes below are priced at $3000, $4900, and $9300, respectively.